However before I explain I must mention Jan left with another man. Actually, a ‘Man of Kent’! ‘Towpath Bill’ is quite proud of his status as a Man of Kent which is defined as a male born in Kent but east of the River Medway. Those males born to the west are known as Kentish Men. Anyway, he took Jan to the supermarket as he had the loan of a car for the day. This loss left me to scramble though the pantry looking for stale morsels and mouldy offcuts. Still, she did return to her true love. The water tank ran dry this morning so Andy was asked if it would be possible to fit the tank sender gauge whilst it was empty. This was done late in the afternoon and I immediately started refilling the tanks. It seemed to be taking a considerable length of time to refill the twin tanks and when we turned on the water pump it made a terrible racket. I went to look at the pump (which is located under the foredeck) and noticed the bilge was filling with water. We’re bloody sinking whilst still on dry land!. A mad panic ensued whilst I turned off the filler hose at the tap, simultaneously looked for Andy to alert him to the situation, whilst all the time running around like a headless chook!. Andy quickly rectified the problem which had been created by the failure to replaced the inlet and outlet hose connections to the water pump after fitting the sender unit. It was a relief to find the problem was so easily resolved. We had visions of the new tank gauge connection leaking. By this time the tanks were 90% full and we had dreaded the thought of all that water entering Waiouru. Hopefully the limited amount of water in the bilge will evaporate over the coming days. 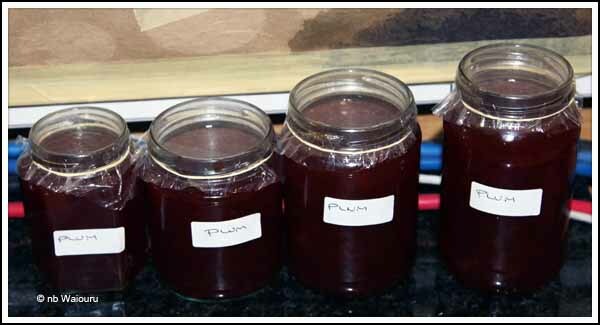 Jan has finished making the wild plum jam. And we have again been out foraging along the towpath for more blackberries. Along the way we found a wild apple tree. 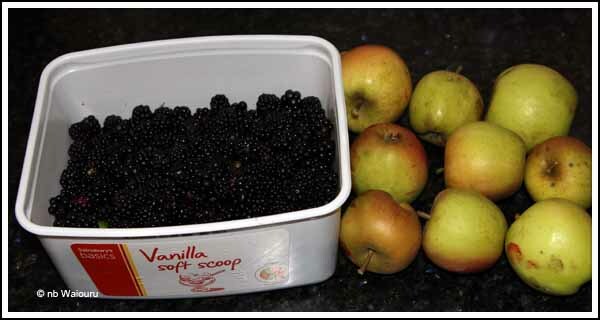 So now Jan has enough apples and blackberries to make a blackberry and apple sponge pudding! There are more blackberries out there which means more foraging is on the agenda. If she can only find more jars there is a strong possibility of blackberry jam.